I know, a post on a Monday…almost unheard of! I have a tiny seedling of an idea, which I’d really value some input on…regarding socks. When the socks in our house die (ie get holes in), they go to one of two places. The ordinary, shop-boughten, mass-produced variety usually become cleaning cloths. They are very convenient and of course free. The hand-knit, can’t quite bear to wash the sink with, but also can’t drive myself to darn (even if I hadn’t just used up all the leftovers I’d need to darn them with) lovelies currently get piled up on a chair in the bedroom. With all the other clothes which need mending but will eventually be thrown out because I rarely get around to mending anything. Anyway, long sentences aside, I have an idea for those languishing holey socks. I want to make then into a different kind of blanket, just sewn/crocheted together side by side. Not unravelled and re-knit. Not even darned if I can get away with it. I grabbed a few of them this morning and laid them out on the bed in a couple of different ways to see if it could work. 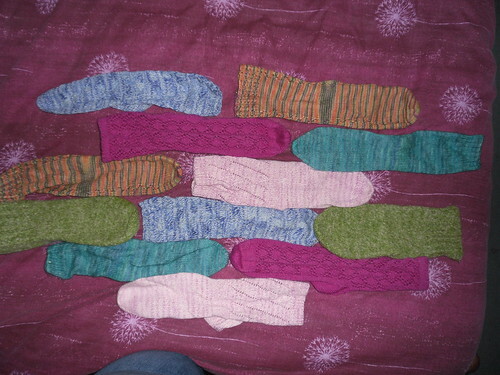 Version B is a little more tricky to arrange, as all the socks have ended up very different sizes and shapes after wearing them for a while, but it looks good. Version A shows off patterns better, but it isn’t as obviously socks (is that good or bad?). I can’t decide which of these to try for. 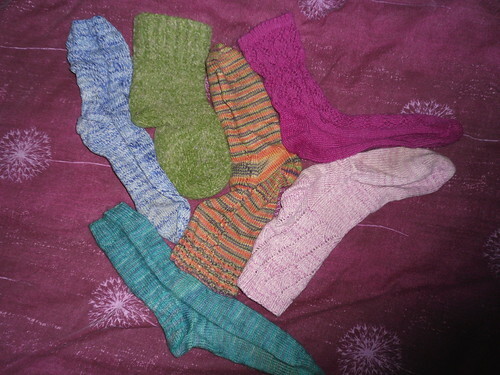 I don’t have enough holey socks for an entire blanket at the moment, but I really want to try the experiment and see if I can make something of these poor wounded soldiers. This entry was posted on February 21, 2011 at 12:09 pm and is filed under knitting. You can follow any responses to this entry through the RSS 2.0 feed. You can leave a response, or trackback from your own site.